Compact, efficient, easy to use and even easier to maintain, the new Easy Tomato Slicer II with its pretensioned cartridge blade assembly is more convenient than ever. The newly designed blade set stays properly aligned and tightened without the need to adjust it. The Easy Tomato Slicer II has an ergonomic handle, polyethylene slide board, hand guards, self-lubricating track, rubber feet, and a table stop like its predecessor, the Easy Tomato Slicer, a staple in food service kitchens. Accommodates a larger tomato than the original Easy Tomato Slicer. 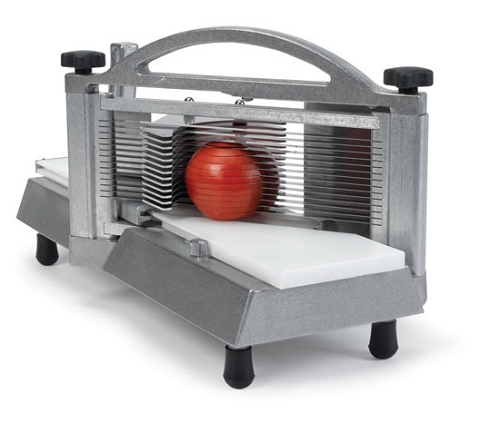 Nemco makes the best cartridge tomato slicer!